Frank retired from his role as Football in the Community Officer at the age of 63 but continues to remain a vital part of the Community and Education Trust at Southend United, while he gives up numerous hours of his time to support the Trust's work across areas such as sports participation, social inclusion, health and education. Our next award is for the Family Club of the Year. This award honours a club from each division that is leading the way in providing the very best experience for families across The Football League. One of these divisional winners will then be crowned overall winner. 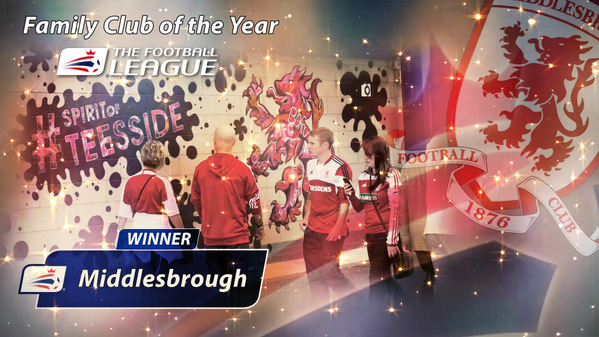 And the overall winner of Football League Family Club of the Year is… Middlesbrough. Championship club Middlesbrough proudly unveiled their ‘Generation Red’ family zone at the beginning of the 2013/14 season. The 3,000-capacity dedicated family space is packed with innovative activities and family-focused supporter care at every home game. Goodluck afcb. Eddie Howe you are one amazing manager! And the other divisional winners for Family Club of the Year are… Wolverhampton Wanderers and Plymouth Argyle. Next up are the awards for the League Football Education Apprentice of the Year for each of Sky Bet League Two, Sky Bet League One and the Sky Bet Championship. The next award of the evening is Young Player of the Year. This award is presented to the best player in The Football League under the age of 21, or playing in the season in which he turns 21. It celebrates the emergence of youth throughout the League’s 72 clubs and has previously been won by the likes of Gareth Bale, Fabian Delph and Wilfried Zaha. Currently a third of all players registered with Football League clubs are eligible to be considered for this award. This year’s nominees for the Young Player of the Year award are Will Hughes of Derby County, Liam Moore of Leicester City and Alex Pritchard of Swindon Town. And the winner is… Will Hughes. One of the most talked about youngsters in the English game, Derby County midfielder Will Hughes has been a fixture in the first team for the last two seasons and he doesn’t even turn 19 until April. Hughes made his debut at the age of 16 in November 2011 before really establishing himself in the 2012/13 season with a series of eye-catching displays in the Rams’ engine room. He has since progressed through the England youth system to reach the under-21 side, and Hughes was also named The Football League’s Young Player of the Month for November 2012. 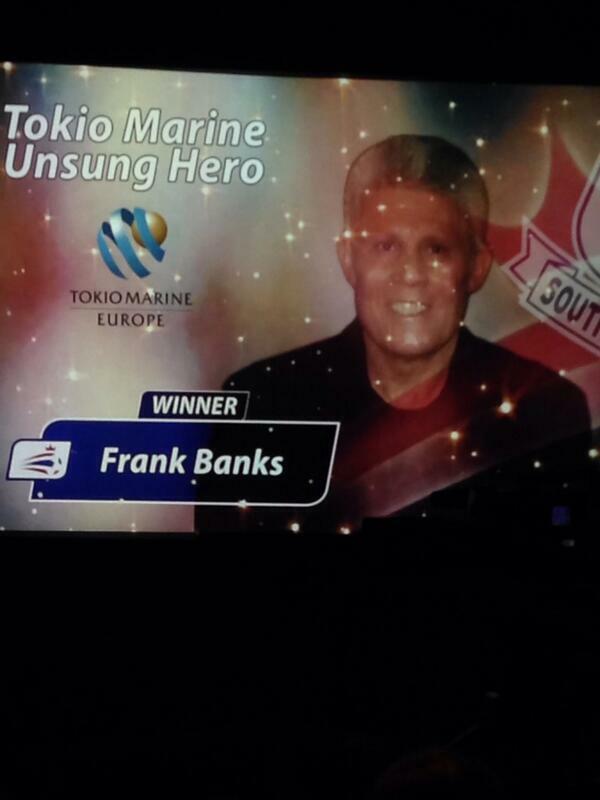 Now we turn to the award for Sky Bet League Two Player of the Year. The Sky Bet Player of the Year awards for the three divisions of the Football League have been voted for by managers of the clubs in each division. Each manager was asked to list their top five players from this season in order, with the scores added up to get a short list and an overall winner. The three nominees for the Sky Bet League Two Player of the Year award are Scott Hogan of Rochdale, Gary Roberts of Chesterfield and Sam Winnall of Scunthorpe United. 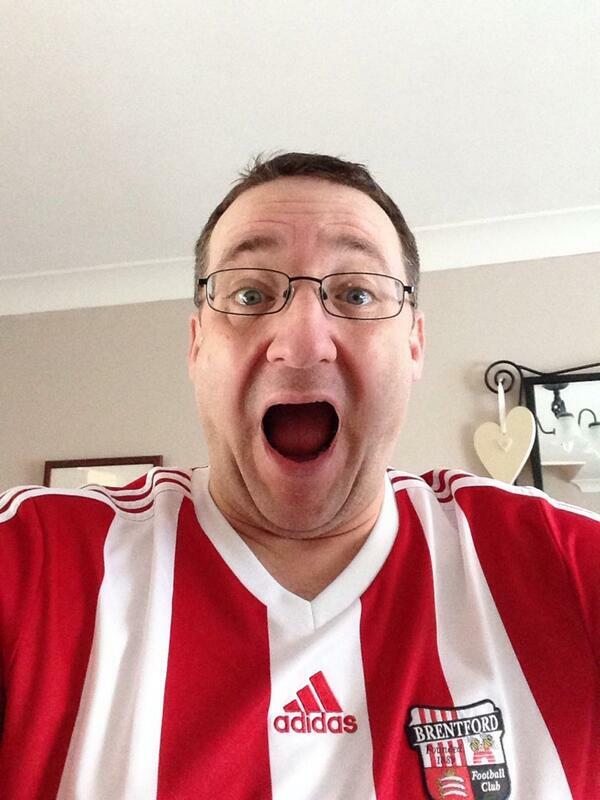 And the winner is… Gary Roberts. 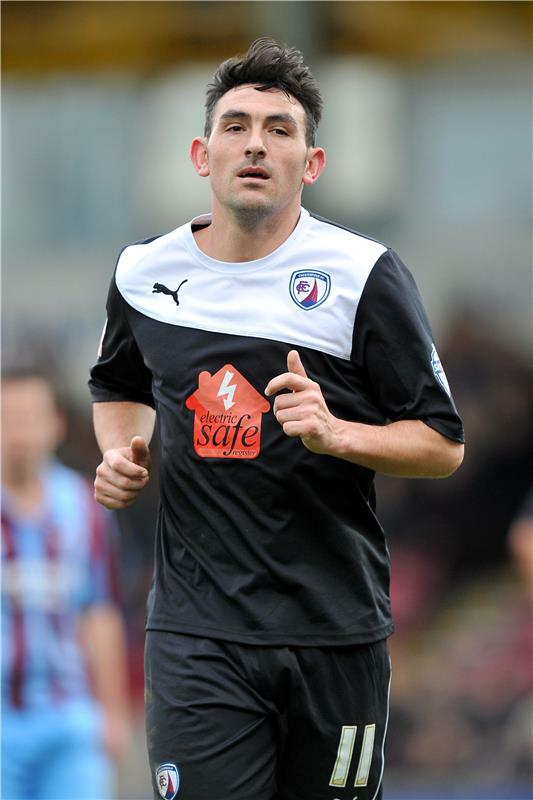 Gary Roberts joined Chesterfield in the summer of 2013 from Swindon Town and he has been an inspirational figure in the Spireites’ bid to win promotion from Sky Bet League Two. Roberts has packed plenty of experience into his career, all of which is proving vital for Paul Cook’s men. As well as scoring some crucial goals, the winger also leads the Sky Bet League Two assists table and his know-how has guided Chesterfield to not just the top of the table but also a place at Wembley in the final of the Johnstone’s Paint Trophy. 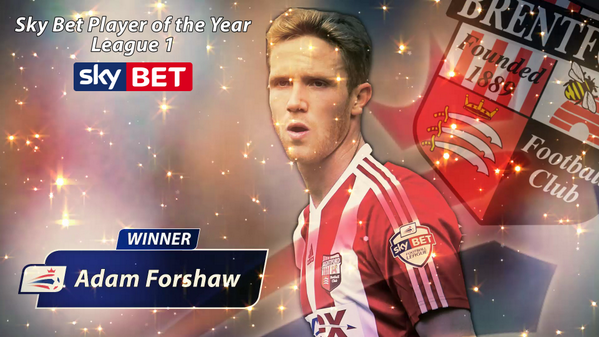 Next up is the Sky Bet League One Player of the Year award. The three nominees for this prize are Adam Forshaw of Brentford, Kevin McDonald of Wolverhampton Wanderers and Alex Pritchard of Swindon Town. And the winner is… Adam Forshaw. Adam Forshaw had a bright 2012/13 but this season he has pushed on to become one of the mainstays of Brentford’s bid to win promotion from Sky Bet League One. The 22-year-old midfielder is an imposing player in the middle of the park for the Bees and helps knit things together well for Mark Warburton’s men. The former Everton man is well regarded at Griffin Park by colleagues and supporters alike for his good attitude and consistent performances. Now we turn to the Sky Bet Championship Player of the Year award. The three nominees for this honour are Danny Drinkwater of Leicester City, Danny Ings of Burnley and Ross McCormack of Leeds United. And the winner is… Danny Ings. Burnley striker Danny Ings has made huge strides as a Sky Bet Championship player this season and his partnership with Sam Vokes is one of the main reasons why Burnley are enjoying a successful campaign and a push towards promotion. Speaking moments after being named Sky Bet League 2 Player of the Year, Gary Roberts said: “Obviously promotion with Chesterfield is the main aim this season, but it’s always nice to be recognised for the work that you are doing on the pitch. “For me, it’s been one of the best years of my footballing career. I love playing for Chesterfield and I’m really enjoying my football.